2014- News roundup: Barrett's funding on the up! Carmen Stringfellow and work colleagues undertook fundraising events at work during February raising £1175! Thank You! In May, Stuart Taylor and other members of Imperial College School of Medicine’s Light Opera Society produced and performed “Les Miserables” in 24 hours in aid of Barrett’s Oesophagus Campaign raising £500. Sue Whall (pictured here with her supportive husband) ran the Reigate Half Marathon on Sunday 21st September raising a staggering £10,000. 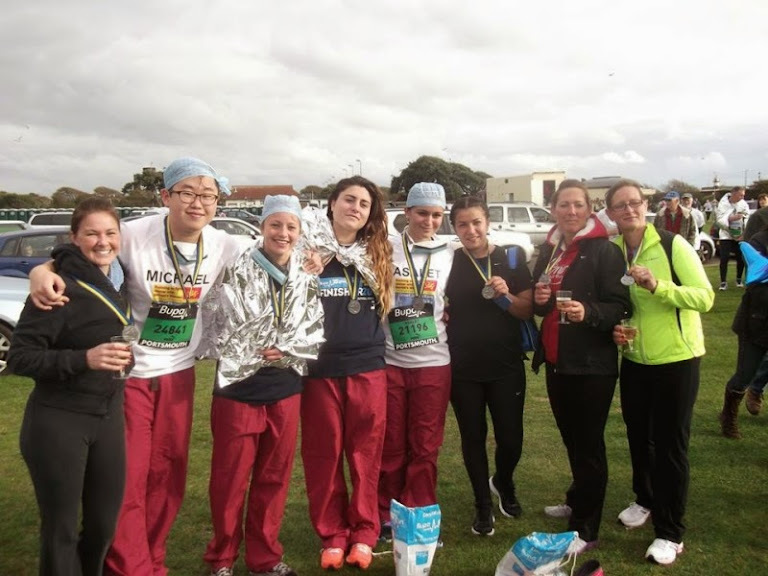 18 runners ran The Great South Run in October raising funds for Barrett’s Wessex (friends of BOC) fine bore endoscope appeal. Chris Robinson cycled from Machu Picchu to The Amazon raising £2,000 for Barrett’s Wessex. Dr Li Von Schack, who ran the London Marathon in 2012, ran the Marathon des Alpes-Maritimes from Nice to Cannes in November raising over £2,000. TV actress Fiona Wade raised nearly £2,000 in conjunction on ITV’s Family Fortunes. Instead of spending money on Christmas cards for her work colleagues, Denise Ensor donated the money she’d have spent and persuaded her colleagues to do likewise. We are also grateful to the following who raised funds for BOC. If they contact us we’ll provide a certificate.